We love to travel. Visiting a new place and discovering it's food, culture, and history is exciting! 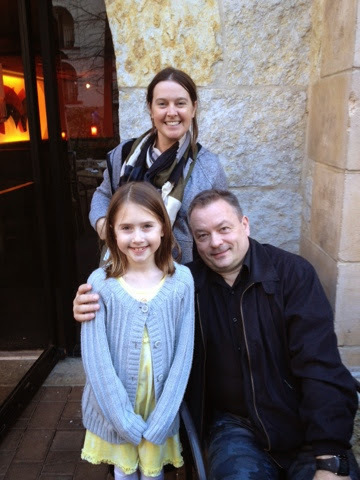 This past weekend, my smallest and I visited San Antonio for her first out of state gymnastics meet. Here is a recap. Our ride from the airport gave us views of the San Antonio skyline. One building looks just like the space needle in Seattle. Several others resembled buildings from other cities and I'm curious to know if the architects were intentional in their design. Our weekend's room was at the Grand Hyatt, which is grand indeed especially when you look at the bill. It was incredibly convenient though as the Alamo Classic was in the adjacent convention center and just a quick walk away. If I could eat beef, I would have enjoyed the Ruth's Chris steakhouse that is housed in this hotel. The main focus of the trip was the meet, so we saw a ton of gymnastics, which thrilled the small person. She bonded with her lovely coach and her coach's daughter who were our roommates for the trip and wonderful company. There was a bunch of laughter and many shared stories. 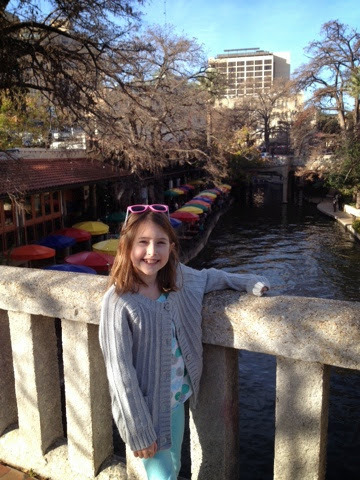 We walked the river walk, which was a great treat. Casa Rio, one of the oldest restaurants on the walk was our first stop. 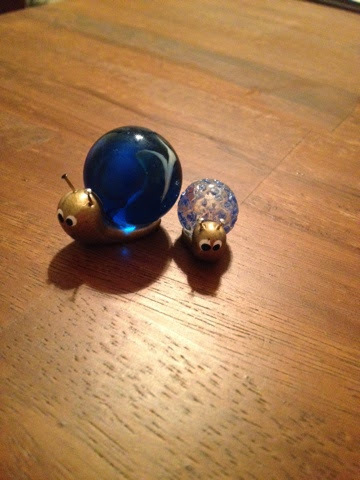 The girls found a couple of treasures along the walk, which they bought with their hard earned (snark) money. Marblies were their favorite craft and will soon be an excuse for me to pull of the sculpey clay. The second night found us at Acenar, a great restaurant with strong margaritas. Luckily, we were with good people who led us back to the hotel. 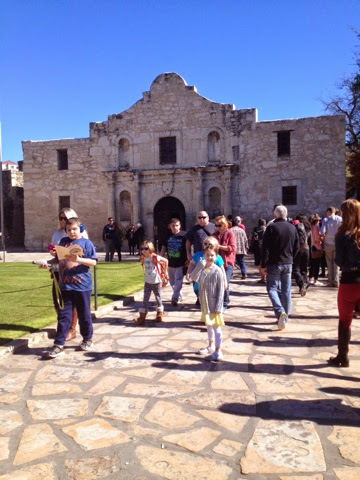 We passed by the Alamo, a thrill for me. It's very pretty all lit up at night. Our visit to the Alamo on our final day was quick, as we were all ravenous. Then the "river" drew us back in and we boarded one of the tour boats to get another history fix. Yes yours truly is a dork and loves to get as much information in as possible. A final treat on this trip was getting to meet a four time Olympic gold medalist! 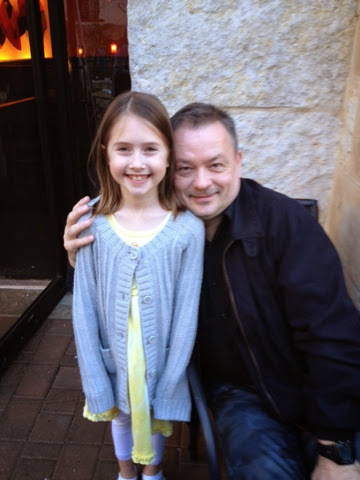 Vladimir Artemov owns a gym in San Antonio and was coached by one of the coaches at my daughter's gym. It was a real bonus to sit with him and his wife chatting about gymnastics, among other things. Then they drove us to the airport and we jammed out to Lady Gaga. Unexpected fun is the best kind of fun. My only regret is not fixing my hair before this picture was taken. Ugh! It was a quick trip, but it was definitely a fun trip. There are a couple more out of state meets approaching and I'll do my best to try and recap those as best I can. The change of scenery was just what the doctor ordered to get us out of the doldrums. We are definitely looking forward to the travel this summer will bring.